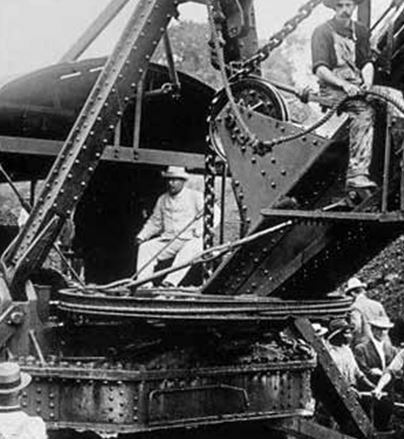 One of the greatest engineering achievements of its time – and ours, was the building of the Panama Canal. It opened on August 14, 1914. I’ve gotten three free trips through the Canal and love it every time. In fact, I lecture on it – the lead-up through the construction. All because I was a speaker on cruise ships. We at SpeakOnCruises.com can show you how to get gigs like this. Back to the Canal. In 1513, Balboa first trundled through the jungles and went the 50 miles to “discover” the Pacific. For centuries, people dreamed about a way to avoid sailing down under Cape Horn to go coast-to-coast. The Canal takes 8,000 miles off the trip. The California Gold Rush was a major reason for the eventual construction of the canal. 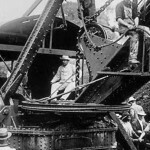 The French under Ferdinand DeLessups had built the Suez Canal, so they embarked on digging the Panama Canal. 20,000 dead men later, they gave up in 1879. No one at the time knew mosquitoes caused yellow fever and malaria! Enter Teddy Roosevelt. He created a federal Canal Commission to oversea this government project. Col George Gorgas, MD, solved the mosquito problem and digging commenced. While the French were going to do it at sea level, it was a better idea to build locks to get through the Continental divide at Culebra. The Canal opened in August 15, 1914 – early and under budget!! But there was no fanfare. Another event at the time overshadowed the celebrations – the First World War. San Diego and San Francisco both were planning theirs for years, so they did have their Panama-Pacific fairs. 100 years later things have changed – the US turned over control to Panama in 1999 – and without any hiccups. New approach channels will open in 2015 to allow bigger “post-panamax” ships to go up their own locks. This will double the amount of traffic. I know all this because I was a speaker and learned a lot. YOU, too, can do this. Don’t just dream it – be it!